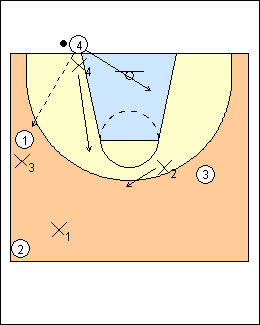 The matchup press starts as a zone then becomes man-to-man on the inbounds pass. Force a high tempo, allow only backward passes, and try to get the ballhandler into a uncontrolled dribble then trap. The white press pressures the inbounder, the black press does not. See Defence - Florida match-up press, Pressing - White & black. The white press is usually used after a score from inside the lane. X4 at the front is the most mobile big, directly in front of inbounder 4. X3 on the left is the most athletic wing, X2 is on the right, X1 is near the halfcourt line, X5 is back. Defenders match up with an attacker in their area and deny the inbounds pass. Wings X3 and X2 are shoulder to shoulder with their attackers, seeing the ball and playing like a defensive back in football, square to the passer. 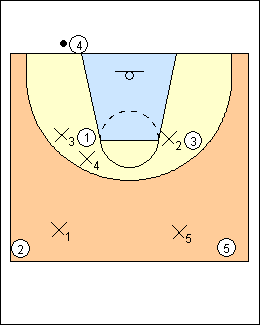 If point guard 1 is directly in front of the ball, X3 wants to be on the side closest to the left sideline. X2 is usually next to his man's left shoulder, he can allow some space if 3 is further away but then closes the gap if 4 turns to look at 3. X1 picks up the ballside attacker closest to halfcourt, X5 takes the remaining attacker. 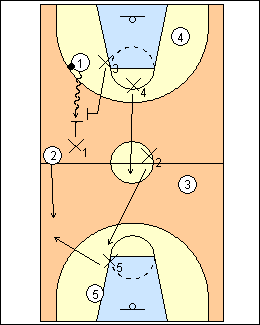 The black press is used after a made perimeter shot or on a dead ball. Instead of pressuring the inbounder, X4 supports X3 and X2 behind the front line of the press. If 1 is ballside, X3 picks him up, and X4 shades this area. If inbounder 4 runs the baseline, X4 goes with him to the other side. X4 matches up with the inbounder after the inbounds pass. Defenders have elbows bent and close to their body, hands close to and thumbs pointing at their shoulders, allowing for quick movement to deflect passes. Don't concede any pass, the on-ball defender wants to deflect a pass, off-ball defenders want to deflect or intercept it. Before the inbounds pass, defenders switch if attackers cross. If 1 goes beyond the top of the circle, X3 runs to the middle to find a new player entering his area. X2 does the same with 3. 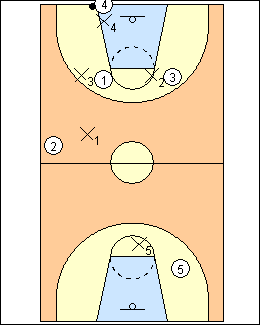 In the white press, X4 will immediately trap an inbounds pass to the coffin corner (ballside near the baseline), as shown. Otherwise X4 drops back below ball level (he is already there in the black press) and matches up with the inbounder. As the inbounds pass is in the air, all weakside defenders move to the middle to prevent a pass to the middle (but X2 still has 3). If a second pass is made to the middle of the floor behind the front line, the press is off. The press stays on for any backward pass. The ballhandler is pressured hard, don't force sideline, force him into a speed dribble without allowing him to blow by, deny all passes upcourt, then trap with the nearest defender in the direction of the dribble. Don't trap a dribbler who is under control, the speed dribble triggers the trap, but the on-ball defender must be close beside the dribbler. Rotations after the trap are mostly instinctive. Either X2 or X5 can rotate to cover 2. Here X5 takes 2, X2 comes back to take 5, X4 is the key defender, he takes away a pass to the middle. The only pass not denied is backwards. All defenders are below ball level. If X3 is beaten and trailing 1 (not able to stay on his hip), then X1 tries to level the dribbler (slow him down or force a sideways dribble) by faking at him. X3 sprints and tries to tip the ball from behind. Trapping good teams is hard, instead try to get turnovers by forcing them into uncontrolled speed dribbles with intense back-tipping, and levelling off if you get beat. 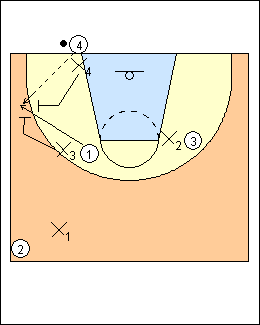 See Defences - 2-2-1 UConn, Morgan Wootten fullcourt (fan trap).